Tag line: "The Best Entertainment since That's Entertainment!" Two years after the Hollywood-themed documentary That’s Entertainment was a box-office sensation, it’s sequel, That’s Entertainment, Part II, hit the scene. Unlike the original, which had a number of celebrity hosts, That’s Entertainment, Part II featured only two: Fred Astaire and Gene Kelly, who, along with presenting the various movie clips that play throughout, also do a little singing and dancing of their own (Astaire, who was in his mid-70s at the time, moved like a man half that age). And, of course, we have the films themselves, excerpts from some of the best that Hollywood of yesteryear had to offer. As with That’s Entertainment, this sequel focuses primarily on the great musicals that Metro-Goldwyn-Mayer produced over the years, from classics like Singin' in the Rain (the excellent “Good Morning” routine) and Meet Me in St. Louis (the incredibly touching “Have Yourself Merry Little Christmas” scene), to such lesser-known pictures as 1948’s The Pirate, in which Gene Kelly and Judy Garland belt out “Be a Clown”; and Kiss Me Kate, a 1953 musical that co-starred future director / choreographer Bob Fosse (the selected clip has Fosse and a handful of others performing a hip, jazz-inspired dance sequence). 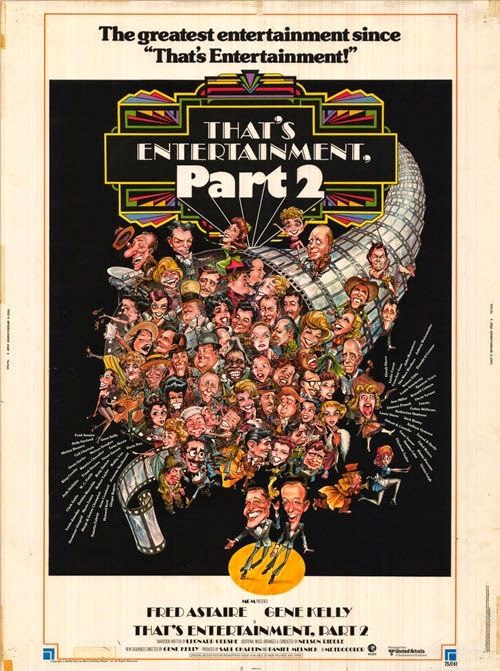 What’s more, an entire section of That’s Entertainment, Part II is dedicated to the black and white era, with excerpts from Vincente Minnelli’s Cabin in the Sky, as well as a key moment from 1943’s Girl Crazy, in which Judy Garland and Mickey Rooney sing the well-known song, “I Got Rhythm”. Also getting his own segment is Frank Sinatra (his performance of “Ol’ Man River”, from 1946’s ‘Til the Clouds Roll By, is truly impressive), and we’re even treated to a sequence from 1939’s Ninotchka, where we get to see Greta Garbo do something she rarely did on-screen: dance! Along with the musicals, That’s Entertainment, Part II changes gears a bit by concentrating on some non-musical films as well, including comedies (a bit lifted from Bud Abbott and Lou Costello in Hollywood is hilarious, and the Marx Brothers’ famous stateroom scene from A Night at the Opera is always fun to watch) and dramas (aside from Grand Hotel, we see the now-famous finale from Gone With the Wind). This added content, during which the movie also focuses on the careers of Spencer Tracy and Katharine Hepburn, takes the That’s Entertainment series in a different, yet ultimately satisfying, direction.